This article is about low-carbohydrate dieting as a lifestyle choice or for weight loss. For information on low-carbohydrate dieting as a therapy for epilepsy, see Ketogenic diet. 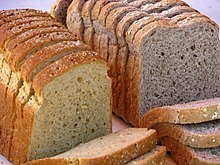 A low-carbohydrate diet restricts the amount of carbohydrate-rich foods – such as bread – in the diet. Low-carbohydrate diets or carbohydrate-restricted diets (CRDs) are diets that restrict carbohydrate consumption. Foods high in carbohydrates (e.g., sugar, bread, pasta) are limited or replaced with foods containing a higher percentage of fats and moderate protein (e.g., meat, poultry, fish, shellfish, eggs, cheese, nuts, and seeds) and other foods low in carbohydrates (e.g., most salad vegetables such as spinach, kale, chard and collards), although other vegetables and fruits (especially berries) are often allowed. There is a lack of standardization of how much carbohydrate low-carbohydrate diets must have, and this has complicated research. One definition, from the American Academy of Family Physicians, specifies low-carbohydrate diets as having less than 20% carbohydrate content. Low-carbohydrate diets are associated with increased mortality, and they can miss out on the health benefits afforded by high-quality carbohydrate such as is found in legumes including grain legumes or pulses, and fruit and vegetables. Disadvantages of the diet might include halitosis, headache and constipation, and in general the potential adverse effects of the diet are under-researched, particularly for more serious possible risks such as for bone health and cancer incidence. Carbohydrate-restricted diets can be as effective, or marginally more effective, than low-fat diets in helping achieve weight loss in the short term. In the long term, effective weight maintenance depends on calorie restriction, not the ratio of macronutrients in a diet. The hypothesis proposed by diet advocates that carbohydrate causes undue fat accumulation via the medium of insulin, and that low-carbohydrate diets have a "metabolic advantage", has been falsified by experiment. It is not clear how low-carbohydrate dieting affects cardiovascular health; any benefit from HDL cholesterol might be offset by raised LDL cholesterol, which risks causing clogged arteries in the long term. Carbohydrate-restricted diets are no more effective than a conventional healthy diet in preventing the onset of type 2 diabetes, but for people with type 2 diabetes they are a viable option for losing weight or helping with glycemic control. There is little evidence that low-carbohydrate dieting is helpful in managing type 1 diabetes. The American Diabetes Association recommends that people with diabetes should adopt a generally healthy diet, rather than a diet focused on carbohydrate or other macronutrients. An extreme form of low-carbohydrate diet – the ketogenic diet – is established as a medical diet for treating epilepsy. Through celebrity endorsement it has become a popular weight-loss fad diet, but there is no evidence of any distinctive benefit for this purpose, and it had a number of side effects. The British Dietetic Association named it one of the "top 5 worst celeb diets to avoid in 2018". The macronutrient ratios of low-carbohydrate diets are not standardized. As of 2018[update] the conflicting definitions of "low-carbohydrate" diets have complicated research into the subject. Both high- and low-carbohydrate diets are associated with increased mortality. The optimal proportion of carbohydrate in a diet for health is thought to be 50-55%. Like other leafy vegetables, curly kale is a foodstuff that is low in carbohydrate. Most vegetables are low- or moderate-carbohydrate foods (in some low-carbohydrate diets, fiber is excluded because it is not a nutritive carbohydrate). Some vegetables, such as potatoes, carrots, maize (corn) and rice are high in starch. Most low-carbohydrate diet plans accommodate vegetables such as broccoli, spinach, kale, lettuce, cucumbers, cauliflower, peppers and most green-leafy vegetables. In 2004, the Canadian government ruled that foods sold in Canada could not be marketed with reduced or eliminated carbohydrate content as a selling point, because reduced carbohydrate content was not determined to be a health benefit. The government ruled that existing "low carb" and "no carb" packaging would have to be phased out by 2006. The National Academy of Medicine recommends a minimum intake of 130 g of carbohydrate per day. The FAO and WHO similarly recommend that the majority of dietary energy come from carbohydrates. Low-carbohydrate diets are not an option recommended in the 2015-2020 edition of Dietary Guidelines for Americans, which instead recommends a low fat diet. Carbohydrate has been wrongly accused of being a uniquely "fattening" macronutrient, misleading many dieters into compromising the nutritiousness of their diet by eliminating carbohydrate-rich food. Low-carbohydrate diet proponents emphasize research saying that low-carbohydrate diets can initially cause slightly greater weight loss than a balanced diet, but any such advantage does not persist. In the long-term successful weight maintenance is determined by calorie intake, and not by macronutrient ratios. The public has become confused by the way in which some diets, such as the Zone diet and the South Beach diet are promoted as "low-carbohydrate" when in fact they would more properly be termed "medium" carbohydrate diets. Low-carbohydrate diet advocates including Gary Taubes and David Ludwig have proposed a "carbohydrate-insulin hypothesis" in which carbohydrate is said to be uniquely fattening because it raises insulin levels and so causes fat to accumulate unduly. The hypothesis appears to run counter to known human biology whereby there is no good evidence of any such association between the actions of insulin and fat accumulation and obesity. The hypothesis predicted that low-carbohydrate dieting would offer a "metabolic advantage" of increased energy expenditure equivalent to 400-600 kcal/day, in accord with the promise of the Atkin's diet: a "high calorie way to stay thin forever". It has been repeatedly found that in the long-term, all diets with the same calorific value perform the same for weight loss, except for the one differentiating factor of how well people can faithfully follow the dietary programme. A study comparing groups taking low-fat, low-carbohydrate and Mediterranean diets found at six months the low-carbohydrate diet still had most people adhering to it, but thereafter the situation reversed: at two years the low-carbohydrate group had the highest incidence of lapses and dropouts. This may be due to the comparatively limited food choice of low-carbohydrate diets. Much of the research into low-carbohydrate dieting has been of poor quality and studies which reported large effects have garnered disproportionate attention in comparison to those which are methodologically sound. Higher quality studies tend to find no meaningful difference in outcome between low-fat and low-carbohydrate dieting. Low-quality meta-analyses have tended to report favourably on the effect of low-carbohydrate diets: a systematic review found that 9 out of 10 meta-analyses with positive conclusions were affected by publication bias. As of 2016[update] it was unclear whether low-carbohydrate dieting had any beneficial effect on cardiovascular health, though such diets can cause high LDL cholesterol levels, which carry a risk of atherosclerosis in the long term. Potential favorable changes in triglyceride and HDL cholesterol values should be weighed against potential unfavorable changes in LDL and total cholesterol values. Some randomized control trials have shown that low-carbohydrate diets, especially very low-carbohydrate diets, perform better than low-fat diets in improving cardiometabolic risk factors in the long term, suggesting that low-carbohydrate diets are a viable option alongside low-fat diets for people at risk of cardiovascular disease. There is only poor-quality evidence of the effect of different diets on reducing or preventing high blood pressure, but it suggests the low-carbohydrate diet is among the better-performing ones, while the DASH diet performs best. Overall, the proportion of carbohydrate in a diet is not linked to the risk of onset of Type 2 diabetes, although there is some evidence that a diet containing certain high-carbohydrate items – such as sugar-sweetened drinks or white rice – is associated with an increased risk. There is a lack of evidence of the usefulness of low-carbohydrate dieting for people with type 1 diabetes. Although for certain individuals it may be feasible to follow a low-carbohydrate regime combined with carefully-managed insulin dosing, this is hard to maintain and there are concerns about potential adverse health effects caused by the diet. In general people with type 1 diabetes are advised to follow an individualized eating plan rather than a pre-decided one. The ADA say low-carbohydrate diets can be useful to help people with type 2 diabetes lose weight, but that these diets were poorly defined, difficult to sustain, unsuitable for certain groups of people and that, for diet composition in general, "no single approach has been proven to be consistently superior". Overall, the ADA recommend people with diabetes should be "developing healthy eating patterns rather than focusing on individual macronutrients, micronutrients, or single foods". They recommended that the carbohydrate in a diet should come from "vegetables, legumes, fruits, dairy (milk and yogurt), and whole grains"; highly-refined foods and sugary drinks should be avoided. Low-carbohydrate dieting has no effect on the kidney function of people who have type 2 diabetes. Historically, limiting carbohydrate consumption was the traditional treatment for diabetes – indeed, it was the only effective treatment before the development of insulin therapy – and when carefully practised, it generally results in improved glucose control, usually without long-term weight loss. The ketogenic diet is used to treat drug-resistant childhood epilepsy. It has become a fad diet for people attempting to lose weight. Dieters trying this often do not achieve true ketosis as this requires extreme carbohydrate restriction, and maintaining a ketogenic diet is difficult. Some diet advocates make misleading claims that the ketogenic diet can treat or prevent cancer. The British Dietetic Association note that a medical ketogenic diet is a useful epilepsy treatment, but for weight loss named it one of the "top 5 worst celeb diets to avoid in 2018". Celebrities endorsing the diet include Gwyneth Paltrow and Mick Jagger. High-quality research shows no long-term weight loss advantage to a ketogenic diet over a low fat diet. There is a lack of data about long-term safety, and low-carbohydrate intake may be associated with increased mortality. Low-carbohydrate dieting is associated with increased mortality, just as high-carbohydrate dieting is. As of 2018[update] research has paid insufficient attention to the potential adverse effects of carbohydrate restricted dieting, particularly for micronutrient sufficiency, bone health and cancer risk. One meta-analysis reported that adverse effects could include "constipation, headache, halitosis, muscle cramp and general weakness". As of 2014 it appeared that with respect to the risk of death for people with cardiovascular disease, the kind of carbohydrates consumed are important; diets relatively higher in fiber and whole grains lead to reduced risk of death from cardiovascular disease compared to diets high in refined-grains. In 1797, John Rollo reported on the results of treating two diabetic Army officers with a low-carbohydrate diet and medications. A very low-carbohydrate, ketogenic diet was the standard treatment for diabetes throughout the nineteenth century. In 1972, Robert Atkins published Dr. Atkins Diet Revolution, which advocated the low-carbohydrate diet he had successfully used in treating patients in the 1960s (having developed the diet from a 1963 article published in JAMA). The book met with some success, but, was widely criticized by the mainstream medical community as being dangerous and misleading, thereby limiting its appeal at the time. The concept of the glycemic index was developed in 1981 by David Jenkins to account for variances in speed of digestion of different types of carbohydrates. This concept classifies foods according to the rapidity of their effect on blood sugar levels – with fast-digesting simple carbohydrates causing a sharper increase and slower-digesting complex carbohydrates, such as whole grains, a slower one. ^ a b c d e f g Seckold R, Fisher E, de Bock M, King BR, Smart CE (October 2018). "The ups and downs of low-carbohydrate diets in the management of Type 1 diabetes: a review of clinical outcomes". Diabet. Med. (Review). doi:10.1111/dme.13845. PMID 30362180. Low‐carbohydrate diets are of interest for improving glycaemic outcomes in the management of Type 1 diabetes. There is limited evidence to support their routine use in the management of Type 1 diabetes. ^ a b Last AR, Wilson SA (June 2006). "Low-carbohydrate diets". American Family Physician. 73 (11): 1942–8. PMID 16770923. ^ a b c d Seidelmann SB, Claggett B, Cheng S, Henglin M, Shah A, Steffen LM, et al. (2018). "Dietary carbohydrate intake and mortality: a prospective cohort study and meta-analysis". Lancet Public Health (Meta-analysis). 3 (9): e419–e428. doi:10.1016/S2468-2667(18)30135-X. PMID 30122560. ^ a b Reynolds A, Mann J, Cummings J, Winter N, Mete E, Te Morenga L (10 January 2019). "Carbohydrate quality and human health: a series of systematic reviews and meta-analyses". Lancet (Review). 393 (10170): 434–445. doi:10.1016/S0140-6736(18)31809-9. PMID 30638909. ^ a b c d e f g h Churuangsuk C, Kherouf M, Combet E, Lean M (2018). "Low-carbohydrate diets for overweight and obesity: a systematic review of the systematic reviews". Obes Rev (Systematic review). 19 (12): 1700–1718. doi:10.1111/obr.12744. PMID 30194696. ^ a b c d e f g h Schwartz MW, Seeley RJ, Zeltser LM, Drewnowski A, Ravussin E, Redman LM, et al. (2017). "Obesity Pathogenesis: An Endocrine Society Scientific Statement". Endocr Rev (Scientific statement). 38 (4): 267–296. doi:10.1210/er.2017-00111. PMC 5546881. PMID 28898979. ^ a b Butryn ML, Clark VL, Coletta MC (2012). Akabas SR, et al., eds. Behavioral approaches to the treatment of obesity. Textbook of Obesity. John Wiley & Sons. p. 259. ISBN 978-0-470-65588-7. Taken together, these findings indicate that calorie intake, not macronutrient composition, determines long-term weight loss maintenance. ^ a b c d e f Hall KD (2017). "A review of the carbohydrate-insulin model of obesity". Eur J Clin Nutr (Review). 71 (3): 323–326. doi:10.1038/ejcn.2016.260. PMID 28074888. ^ a b Mansoor N, Vinknes KJ, Veierød MB, Retterstøl K (February 2016). "Effects of low-carbohydrate diets v. low-fat diets on body weight and cardiovascular risk factors: a meta-analysis of randomised controlled trials". The British Journal of Nutrition. 115 (3): 466–79. doi:10.1017/S0007114515004699. PMID 26768850. ^ a b Gjuladin-Hellon T, Davies IG, Penson P, Amiri Baghbadorani R (2018). "Effects of carbohydrate-restricted diets on low-density lipoprotein cholesterol levels in overweight and obese adults: a systematic review and meta-analysis". Nutr Rev (Systematic review). 77 (3): 161–180. doi:10.1093/nutrit/nuy049. PMID 30544168. ^ a b c d Brouns F (2018). "Overweight and diabetes prevention: is a low-carbohydrate-high-fat diet recommendable?". Eur J Nutr (Review). 57 (4): 1301–1312. doi:10.1007/s00394-018-1636-y. PMC 5959976. PMID 29541907. ^ a b Meng Y, Bai H, Wang S, Li Z, Wang Q, Chen L (2017). "Efficacy of low carbohydrate diet for type 2 diabetes mellitus management: A systematic review and meta-analysis of randomized controlled trials". Diabetes Research and Clinical Practice. 131: 124–131. doi:10.1016/j.diabres.2017.07.006. PMID 28750216. ^ a b c d American Diabetes Association Professional Practice Committee (2019). "Professional Practice Committee: Standards of Medical Care in Diabetes—2019". Diabetes Care. 42 (Supplement 1): s46–s60. doi:10.2337/dc19-S005. PMID 30559231. ^ a b c d e f "Top 5 worst celeb diets to avoid in 2018". British Dietetic Association. 7 December 2017. The British Dietetic Association (BDA) today revealed its much-anticipated annual list of celebrity diets to avoid in 2018. The line-up this year includes Raw Vegan, Alkaline, Pioppi and Ketogenic diets as well as Katie Price's Nutritional Supplements. ^ Westman EC, Feinman RD, Mavropoulos JC, Vernon MC, Volek JS, Wortman JA, Yancy WS, Phinney SD (2007). "Low-carbohydrate nutrition and metabolism". Am. J. Clin. Nutr. (Review). 86 (2): 276–84. doi:10.1093/ajcn/86.2.276. PMID 17684196. ^ a b Feinman RD, Pogozelski WK, Astrup A, Bernstein RK, Fine EJ, Westman EC, et al. (2015). "Dietary carbohydrate restriction as the first approach in diabetes management: critical review and evidence base". Nutrition (review). 31 (1): 1–13. doi:10.1016/j.nut.2014.06.011. PMID 25287761. ^ Forouhi NG, Misra A, Mohan V, Taylor R, Yancy W (2018). "Dietary and nutritional approaches for prevention and management of type 2 diabetes". BMJ. 361: k2234. doi:10.1136/bmj.k2234. PMC 5998736. PMID 29898883. ^ Hashimoto Y, Fukuda T, Oyabu C, Tanaka M, Asano M, Yamazaki M, Fukui M (2016). "Impact of low-carbohydrate diet on body composition: meta-analysis of randomized controlled studies". Obes Rev (Review). 17 (6): 499–509. doi:10.1111/obr.12405. PMID 27059106. ^ a b Giugliano D, Maiorino MI, Bellastella G, Esposito K (2018). "More sugar? No, thank you! The elusive nature of low carbohydrate diets". Endocrine (Review). 61 (3): 383–387. doi:10.1007/s12020-018-1580-x. PMID 29556949. ^ Weickert MO, Pfeiffer AF (March 2008). "Metabolic effects of dietary fiber consumption and prevention of diabetes". The Journal of Nutrition. 138 (3): 439–42. doi:10.1093/jn/138.3.439. PMID 18287346. ^ Ceausu J (26 November 2004). "CANADA: Low-carb products could be barred with new labelling rules". just-food.com. Aroq Ltd. Retrieved 12 February 2014. ^ "Dietary Reference Intakes (DRIs)" (PDF). National Academy of Medicine. Archived from the original (PDF) on 19 October 2015. Retrieved 31 August 2015. ^ Joint WHO/FAO expert consultation (2003). Diet, Nutrition and the Prevention of Chronic Diseases (PDF). who.int. Geneva: World Health Organization. pp. 55–56. ISBN 978-92-4-120916-8. Archived from the original (PDF) on 4 April 2003. ^ a b Sizer FS, Whitney E (2016). Nutrition Concepts and Controversies (14th ed.). Brooks Cole. pp. 119, 367. ISBN 978-0-495-22011-4. ^ a b c d Nonas CA, Dolins KR (2012). Akabas SR, et al., eds. Dietary intervention approaches to the treatment of obesity. Textbook of Obesity. John Wiley & Sons. pp. 295–309. ISBN 978-0-470-65588-7. ^ a b Belluz J (20 February 2018). "We've long blamed carbs for making us fat. What if that's wrong?". Vox. ^ Barclay E (20 September 2012). "Billionaires Fund A 'Manhattan Project' For Nutrition And Obesity". WBUR News. ^ Waite E (8 August 2018). "The Struggles of a $40 Million Nutrition Science Crusade". Wired. ^ Hu T, Mills KT, Yao L, Demanelis K, Eloustaz M, Yancy WS, Kelly TN, He J, Bazzano LA (October 2012). "Effects of low-carbohydrate diets versus low-fat diets on metabolic risk factors: a meta-analysis of randomized controlled clinical trials". American Journal of Epidemiology. 176 Suppl 7 (Suppl 7): S44–54. doi:10.1093/aje/kws264. PMC 3530364. PMID 23035144. ^ Public Health England (2015). "Carbohydrates and Health" (Report). Scientific Advisory Council on Nutrition: 57, 85 – via The Stationery Office. No significant association was found between total carbohydrate intake as g/day and incidence of type 2 diabetes mellitus. ^ van Zuuren EJ, Fedorowicz Z, Kuijpers T, Pijl H (August 2018). "Effects of low-carbohydrate- compared with low-fat-diet interventions on metabolic control in people with type 2 diabetes: a systematic review including GRADE assessments". The American Journal of Clinical Nutrition. 108 (2): 300–331. doi:10.1093/ajcn/nqy096. PMID 30007275. ^ Suyoto PST (2018). "Effect of low-carbohydrate diet on markers of renal function in patients with type 2 diabetes: A meta-analysis". Diabetes Metab Res Rev (Meta-analysis). 34 (7): e3032. doi:10.1002/dmrr.3032. PMID 29904998. ^ Meng Y, Bai H, Wang S, Li Z, Wang Q, Chen L (September 2017). "Efficacy of low carbohydrate diet for type 2 diabetes mellitus management: A systematic review and meta-analysis of randomized controlled trials". Diabetes Research and Clinical Practice. 131: 124–131. doi:10.1016/j.diabres.2017.07.006. PMID 28750216. ^ a b Maughan RJ, Greenhaff PL, Leiper JB, Ball D, Lambert CP, Gleeson M (1997). "Diet composition and the performance of high-intensity exercise". J Sports Sci (Review). 15 (3): 265–75. doi:10.1080/026404197367272. PMID 9232552. ^ a b c Ruscigno M (2018). "The Keto Diet: More Fad than Long Term". Environmental Nutrition (March): 3. ^ a b Ting R, Dugré N, Allan GM, Lindblad AJ (2018). "Ketogenic diet for weight loss". Can Fam Physician. 64 (12): 906. PMID 30541806. ^ Ullah W, Hamid M, Mohammad Ammar Abdullah H, Ur Rashid M, Inayat F (January 2018). "Another "D" in MUDPILES? A Review of Diet-Associated Nondiabetic Ketoacidosis". Journal of Investigative Medicine High Impact Case Reports. 6: 232470961879626. doi:10.1177/2324709618796261. PMC 6108016. PMID 30151400. ^ "Healthy Weight—The truth about carbs". National Health Service. 19 December 2018. ^ Hu T, Bazzano LA (April 2014). "The low-carbohydrate diet and cardiovascular risk factors: evidence from epidemiologic studies". Nutrition, Metabolism, and Cardiovascular Diseases. 24 (4): 337–43. doi:10.1016/j.numecd.2013.12.008. PMC 4351995. PMID 24613757. ^ Morgan W (1877). Diabetes mellitus: its history, chemistry, anatomy, pathology, physiology, and treatment. ^ Einhorn M (1905). Lectures on dietetics. ^ Banting W (1869). Letter On Corpulence, Addressed to the Public (4th ed.). London, England: Harrison. Retrieved 2 January 2008. ^ Groves B (2002). "William Banting Father of the Low-Carbohydrate Diet". The Weston A. Price Foundation. ^ Allen FM, Fitz R, Stillman E (1919). Total dietary regulation in the treatment of diabetes. New York: The Rockefeller Institute for Medical Research. ^ Another publication of similar regimen was Hill LW, Eckman RS (1915). The Starvation Treatment of Diabetes with a series of graduated diets as used at the Massachusetts General Hospital. Boston: W.M. Leonard. This was so well received that it went into revised editions, eventually becoming The Allen (Starvation) Treatment of Diabetes with a series of graduated diets (4th ed.). Boston. 1921. p. 140. ^ Also see "Discussion on the Modern Treatment of Diabetes". Transactions of the Medical Society of London. 45: 3–16. 24 October 1921. ^ Air Force Diet. Toronto, Canada: Air Force Diet Publishers. 1960. ^ Jameson G, Williams E (2004). The Drinking Man's Diet. San Francisco: Cameron. ISBN 978-0-918684-65-3. . See also Farnham A (2004). "The Drinking Man's Diet". Forbes.com. ^ Lutz W, Allan C (2000). Life Without Bread (1st English language ed.). McGraw-Hill. ISBN 978-0-658-00170-3. ^ Gordon E, Goldberg M, Chosy G (October 1963). "A New Concept in the Treatment of Obesity". JAMA. 186 (1): 50–60. doi:10.1001/jama.1963.63710010013014. PMID 14046659. ^ "A critique of low-carbohydrate ketogenic weight reduction regimens. A review of Dr. Atkins' diet revolution". JAMA. 224 (10): 1415–9. June 1973. doi:10.1001/jama.1973.03220240055018. PMID 4739993. ^ Jenkins DJ, Wolever TM, Taylor RH, Barker H, Fielden H, Baldwin JM, Bowling AC, Newman HC, Jenkins AL, Goff DV (March 1981). "Glycemic index of foods: a physiological basis for carbohydrate exchange". The American Journal of Clinical Nutrition. 34 (3): 362–6. doi:10.1093/ajcn/34.3.362. PMID 6259925. ^ "PBS News Hour: Low Carb Craze". Pbs.org. Retrieved 18 December 2011. ^ Reinberg, Steven. "Americans Look for Health on the Menu: Survey finds nutrition plays increasing role in dining-out choices". Archived from the original on 28 September 2007. Retrieved 28 September 2007. ^ Schooler L (22 June 2004). "Low-Carb Diets Trim Krispy Kreme's Profit Line". Morning Edition. National Public Radio. Retrieved 18 December 2011. ^ St Jeor ST, Howard BV, Prewitt TE, Bovee V, Bazzarre T, Eckel RH (October 2001). "Dietary protein and weight reduction: a statement for healthcare professionals from the Nutrition Committee of the Council on Nutrition, Physical Activity, and Metabolism of the American Heart Association". Circulation. 104 (15): 1869–74. doi:10.1161/circ.104.15.1869 (inactive 2019-02-15). PMID 11591629. These diets are generally associated with higher intakes of total fat, saturated fat, and cholesterol because the protein is provided mainly by animal sources. ... Beneficial effects on blood lipids and insulin resistance are due to the weight loss, not to the change in caloric composition. ... High-protein diets may also be associated with increased risk for coronary heart disease due to intakes of saturated fat, cholesterol, and other associated dietary factors. ^ "Atkins diet boss: 'Eat less fat". BBC News. 19 January 2004. Retrieved 12 September 2007. This page was last edited on 10 April 2019, at 11:09 (UTC).